Manicuring is not just something you do to your nails. It is an important step to prepare your cannabis for the drying and curing processes, plus it makes sure your bud looks well shaped and professional. Manicuring cannabis is not only an aesthetic treatment - by separating prime bud from the leaves, the quality of the product greatly improves. It is recommended to manicure your bud before drying, but some growers prefer to go the other way around. We have found the process to be way easier when done on the fresh plant. First, it is advisable to always harvest your cannabis in the morning before the lights go on (or the sun comes up). This is because the plants store sugar and starches in the roots overnight. As the light comes on, these nutrients are transported upwards across the plant to prepare it for the day. However, you want to avoid this, as the sugars make the smoke harsher. You can easily avoid the upwards movement by first cutting all the base stems as you are about to harvest. Once that is cut, you can turn on the lights to work. Once you have harvested the plant, it is time to move it to your drying room for its manicure. It is good to have a well-ventilated area and a clean set up ready to place your trimmings upon. This will ensure that all plant material remains clean – black plastic bags are ideal for this. It is highly recommended to wear some latex gloves, so your hands do not become covered in resin. Start by removing the large fan leaves at their base. You can do that with you fingers, as they snap of easily. After this, start removing the secondary leaves, placing them in another pile. Once you have removed these, the plant will start to look fairly bare. Now you will have access to some of the trim leaves, which you can remove. Definitely invest in a good trimming scissor for that job, it will make the work significantly easier. If you find that your scissor is getting gunked up in resin, you can use rubbing alcohol to clean it off. To begin with the fine work, take your first plant and remove any branches, leaves or excess trim that you may have missed in the prep – separating them into piles like before for later use. Cut the remaining branches and stems into workable, hand-held sizes. This will make the next step easier. Repeat this process for all your cannabis. Next, take each remaining branch and clip away the prime buds from the stem. It is a much more precise phase that will allow you to separate the real good stuff from the rest. It is best to cut between the bud and the leaf, snipping the leaf away at the base. If you cannot get to the base of the leaf, cut away as much of the leaf as you can. The stem and leaf close to the bud is going to be covered in resin filled trichomes. This makes it prime trim and excellent for making hash or as part of your dried smoking material – definitely don’t throw that trim away. 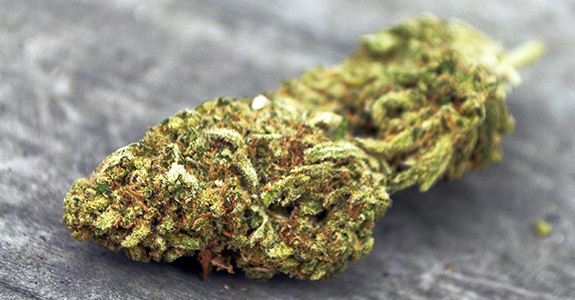 How much you end up removing will depend on whether you are looking for quantity or quality, if you remove everything except the prime bud, you will be left with the best quality bud possible. Leaving trim leaves in with the bud will reduce the overall quality, but increase the quantity after curing. Of course, you still have all of the trimmings to play around with as well. Once it’s all neatly manicured, all you have to do is move everything into the drying nets. Try and salvage any resin that gets on your tools, gloves and bags. Resin can be frozen in a freezer and then shattered and scraped off at a later point. This is some prime, potent stuff, and can make a great addition to a pipe. It is best to put these things in another plastic bag before freezing them, so that the resin does not come into direct contact with any ice.